This entry was posted on December 5, 2013 by Heather. It was filed under north bay and was tagged with birch trees, calm, Heather Cote Photography, Lake Nipissing, naked trees, nature, North Bay, photos, sunny, waterfront. the prettiest yet i think….just lovely! thanks Cindy…it is much warmer here today and most of the snow is gone…so instead of this beautiful image it is wet and melting! thanks Terence…wet and melting all the snow today! thanks Carolyn…it is much warmer today, snow is melting! lol…yes wouldn’t it be pretty! This one is gorgeous. I love the snow on the bush. This could make a perfect New Year card. Very pretty! thanks Vahagn…I think the birch trees add a nice touch. 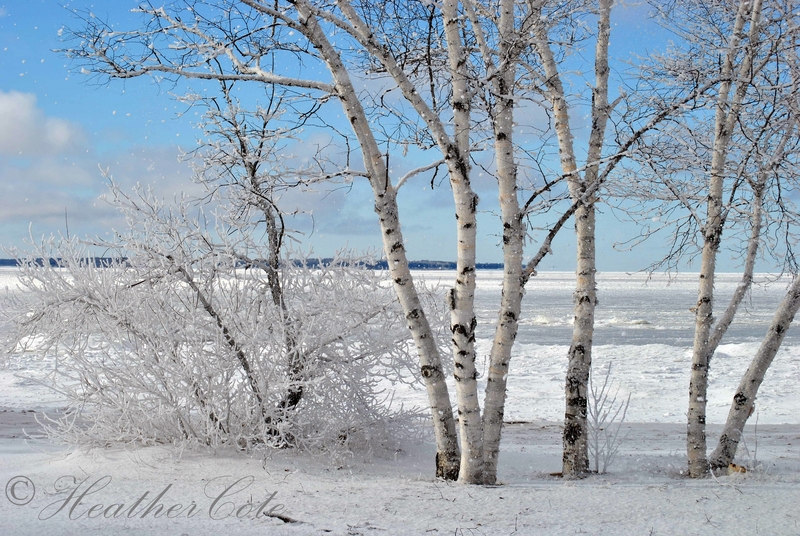 I love birch trees – they are so pretty! I do as well…love the white and dark of their trunks especially! lol…thank you, I’ll do my best…it is sunny and warmer today…much of the snow we had melted as it has been warmer! Oh this is lovely … beautiful birches, white snow, blue sky! Heather, I think you have found your season! Your last few posts of the winter landscape have been some of the best on your blog. Great compositions and technically well executed. Ice makes everything look magical. Except when you have to drive on it….then its downright scary. I’m not a fan of winter even though I live in Ontario…but…I do agree it does look like a winter wonderland but… only for a day or so then it melts and everything looks dirty… 😦 regardless it is what it is! Icy roads are definitely scary…they leave a person helpless on the road…we generally don’t have a true ice storm and I pray we continue that way!! !